To support education and hands on care programs for teens, women and children. We are excited to announce The Edward and Holli Gersh Foundation $50K Challenge. For every dollar raised now until March 31st, the foundation will make a 100 percent matching donation, up to a total of $50,000. That means your donation today will be doubled! "With the subject of sexual abuse and violence against women so much in the forefront these days, I want to mention an organization that is very close to my heart. END ABUSE 4 Good is a not for profit organization who's mandate is to support victims of domestic/sexual violence and to educate young women (and now men) about the 8 signs of abuse. Working with and supporting abused women and their children, as well as speaking with these young people about the behavior that is NOT OK, is amazingly empowering for those we work with. To watch a mother's face when she looks in the mirror after having a make over, and finally sees herself as person of value. Seeing the tears in her eyes as she sees the joy on her child's face as he/she receives the wished for but never expected Christmas gift she /he dreamed of. To watch a young persons eyes as they have their first "Ah ha" moment, as they realize that the behavior that they have been suffering at the hands of their boyfriend is ABUSE, Is NOT their fault, and is NOT deserved! We can actually change the way these young people see themselves and help them have more healthy successful relationships in the future. The amazing work that we are doing can only be done if we have the funds to continue! 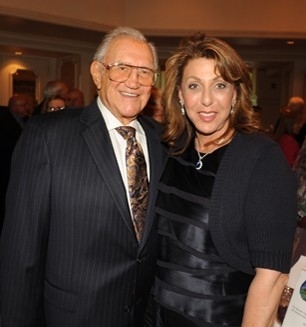 It is because of this, that The Edward and Holli Gersh Foundation has established a $50,000 matching grant. We will match all gifts up to $50,000. that are made by the end of the year! These women, girls, and yes boys, need your help. The gift you give by March 31st. will be matched, so please be generous! Thank you so very much, Holli Gersh"
The goal: use education to prevent girls and women from being blindsided by domestic abuse. The Education = Prevention Tour has currently reached nearly 10,000 young girls, college students and women with an interactive workshop provided at no cost to grammar, high schools and local organizations. Without early intervention, girls are left at a disadvantage when entering the dating world. Every girl deserves to know the signs of abuse - before the first date. “It was a privilege to listen to your presentation on detecting domestic abuse. Given the relevance of the topic, I believe that this should be made available to many more young people. I am a firm believer in the power of education, awareness and empowerment. With this in mind, I would like to strongly endorse your program as a life-saving tool for college-aged young women and men. I will be writing to my former program to make them aware of your work”. “When speaking with my students yesterday, they all unanimously agreed that this type of presentation should be given to all grade levels, even 9th graders, because abuse happens to all groups. A few students handed in written evals and all said how useful the presentation was and that they took away much needed information. They all mentioned the brochure "Share The 8 before It's Too Late" and stated that they would share this information with friends and family. I think your openness during the presentation made the message hit home. One student wrote, "I will respect myself and I will ­not let anyone abuse me or undermine me. The goal: help women and children survivors of domestic violence on the road to recovery. Feeling forgotten, isolated, alone and lost is typical for most survivors and we’ve set out the change that. Throughout the year EndAbuse4Good is on the move, heading into shelters with our very special brand of hands on care. Partnering with Safe Horizon, Barneys New York, Lowes, Glam4Good and Metamorphosis New York, our expert team of celebrity stylists, hair and makeup professionals, fashion photographers, massage therapists, DJ’s, face painters, balloon artists, puppeteers, caterers and more help to bring back the joy and confidence taken away by a batterer. As Oprah says, "Beauty on the outside lights up beauty on the inside." We aim to make starting over a journey filled with joy. The only way for us to claim this generous $50,000 gift is to match it! Please donate today so we activate every dollar of this grant and grow our community reach! EndAbuse4Good is proud to have the support of celebrities such as Katie Couric, Cyndi Lauper, Patrick Stewart and Mel Brooks in our campaign to prevent abuse. To find out more about the EndAbuse4Good CelebriTee Campaign, click here.